Rex Remodelers, Fox Cities. Roofing, Vinyl and Aluminum Siding, Windows, Kitchens and Baths. but afraid of sky-high prices to have it done professionally? Nothing to fear. Call Us! Now serving the Fox Cities area. 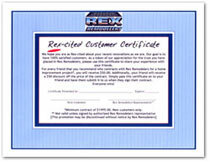 Rex Remodelers : Call 920-574-2908 for Roofing, Siding, Replacement Windows, Kitchens and Baths in the Fox Cities Area.